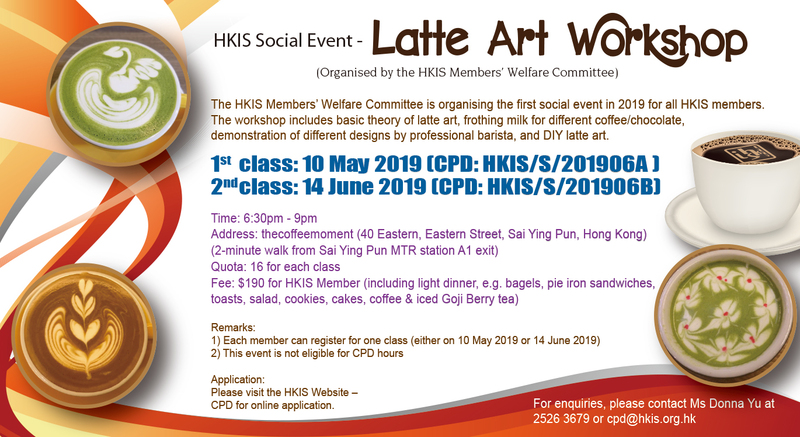 Closing Date : Please refer to "Remarks"
The HKIS Members’ Welfare Committee is organising the first social event in 2019 for all HKIS members. The workshop includes basic theory of latte art, frothing milk for different coffee/chocolate, demonstration of different designs by professional barista, and DIY latte art. 1) The content of the workshop is the same for 1st Class and 2nd Class. 3) This event is not eligible for CPD hours. 4) While HKIS will NOT arrange for insurance policy for the participants, members may consider taking out their own insurance policy to cover their own risks.